In "The Way of the Shadow" we are introduced to the two primary characters of the Night Angel series by Brent Weeks; Azoth and Durzo. Durzo is a wetbot, sort of like an assassin but better because wetboys have the use of the Talent (magic). Azoth is a young boy without much hope in his life. He has no family, only 2 friends, no home, and he is low on the totem pole of power within his chosen street gang. However, he dreams of being much more after meeting Durzo Blint; he dreams of being a wetboy - a man with no fears and endless freedom.Azoth can only see one way to become a wetboy and that is by getting Durzo to apprentice him - however Durzo doesn't take apprentices and even if he does Azoth would have to pay a high price to prove his worth.The Way of the Shadow is a very easy and fast read with great pacing. Azoth's two friends Jarl and Doll Face are both small gems nestled in the ugly world of the warrens that Azoth lives within and the three of them are all characters you can care about. Durzo is more than just an efficient killer though, truth be told, he remains fairly one dimensional throughout this first installment.The world featured in the tale is interesting, the magic is also sort of unique in how it explains the limitations of certain mages (or how magic even exists) and some of the nations within the world promise to be very interesting if Weeks ever revisits the world in another story. I bought all three books of this series at once so I was able to read the trilogy nonstop which helped keep my interest as well.I am also biased going in as I tend to enjoy stories featuring a rogue and this story, obviously, fits in that mold. Weeks does a decent job of depicting the assassins life with his many hideouts and traps. However, at times, I felt like the wetboys were too powerful compared to the rest of the main characters in the world. 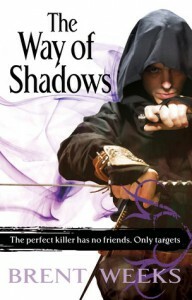 Even with that said "The Way of the Shadow" was nice introduction to the world.